learning into existing schema. The process of planning, drafting, revising, editing, and rewriting gives our students the time they need to accommodate new knowledge, classifying it in a way that will help their brain remember, store, and retrieve it. Authors help their readers do all these things by intentionally choosing the appropriate organizational structures to frame their writing. Writers and readers co-construct knowledge, discovering the writing and reading processes that work for them to create and comprehend informational texts. In their book Pathways to the Common Core Calkins, Ehrenworth, and Lehman discuss this process as well as the importance of being able to use it across the day. in the service of discipline-based learning. (p. 143). We use informational writing across the curriculum to answer essential questions or offer an explanation, as well as to examine events and processes that affect our lives. Informational writing is much more than creating animal or state reports. In the age of Common Core, our thinking must evolve to include new approaches for delivering information that a target audience wants to read. The Common Core recognizes the need for a writing process, but also challenges writers to look beyond the ordinary and find opportunities for experimenting with new organizational scaffolds. Today through the use of the internet we have information at our fingertips. Print is everywhere. But what makes it interesting? What makes a reader want to look further? Writers need to find unique ways of presenting information that will invite participation and transaction with text. By introducing different scaffolds throughout a semester or school year, teachers can help students make informed decisions about what organizational global structure (scaffold) would work best for any given piece. Within the informational text students may also make use of many organizational patterns such as problem/solution, cause/effect, compare/contrast, time sequencing, and definition/description. These patterns can change from one paragraph to the next. “The Common Core asks teachers and students to turn informational texts – their own and those written by others – inside out so as to study the designs that undergird the texts, noting the parts and the ways that the different parts have been brought together.” (Calkins et. al, 147). By using a mentor text and engaging in a close read, students can discover how an author puts a text together. It’s like watching a building being raised and seeing the underlying structure that supports the walls, windows, doors, and roof. The organizational scaffold that students can discover will inform their decisions about how they organize their writing in a meaningful, logical way. “When I was young in the mountains…” is the dependent clause that begins many pages of author Cynthia Rylant’s children’s book, also the title of her well known memoir. After the first read to simply enjoy the wonderful words and images that appear in this text, a reader will notice that this clause only starts a sentence that begins a new vignette. Each slice of life – whether it is about Grandfather returning from a day in the coal mines; dinner and a trip to the outhouse; walking to the swimming hole; or pumping water, heating it, and taking a bath – each tiny story begins with this phrase. Readers can understand that the writer is sending a clear message to expect a new facet of life in Appalachia. full of good-byes and well-wishes. The birds who are leaving look very serious. We are often too quick to introduce students to a scaffold and have them try it out without first reflecting on the author’s intended purpose. We find students writing their versions of Rylant’s text using the repeated introductory phrase to begin each sentence. Instead, if we spend time examining the text with students, we can help them discover that Rylant only uses the phrase “In November…” to introduce a new idea. The sentences that do not use the phrase provide details. This text helps students understand that it’s not about the number of ideas in a text, but rather how each idea is developed through elaboration – examples, description, explanations, and anecdotes. The repeated introductory phrase is a scaffold that is used by many authors. In Up North at the Cabin, Marsha Wilson Chall strings together a series of vignettes that reveal something about herself through her childhood memories of summers spent on a lake. peanut-butter-and-worm sandwiches, then jig my line and wait. In both Miss Moore Thought Otherwise by Jan Pinborough and The Tree Lady by H. Joseph Hopkins, picture book biographies, the authors use a repeated sentence or variation of it to show the forward thinking of the women – Anne Caroll Moore and Kate Sessions. How to Be by Lisa Brown presents a unique scaffold that can be used at all grade levels across the curriculum. Students will discover that the text is written like an essay or poem of advice. Each sentence begins with a verb that illustrates a unique quality about the subject. A similar scaffold can be found in “Things to Do If You Are a Pencil” by Elaine Magliaro and “Things to Do If You Are the Sun” by Bobbi Katz. These poems can be found in Falling Down the Page: A Book of List Poems edited by Georgia Heard. Taylor, a first grade student, initially wrote a “How to Be” piece about herself and was able to transfer the use of the scaffold to write about whales in a science unit later that same year. Like to watch Cartoon Network. Pretend to be able to see animals underwater. That’s how to be Taylor! Play, jump, and leap in the water. Migrate to look for food. That’s how to be a whale! You can see that Taylor was able to find the right verb to communicate her ideas and understanding about whales. From her writing we can learn what she thinks is important about whales (and about herself). All good research uses a central or essential question that peaks the curiosity of the researcher. A question scaffold will help students find out what they want to know about instead of finding the answers to questions their teachers may pose. There are several variations to a question scaffold. Susan Stockdale uses a basic question-answer scaffold around a central theme in her book Nature’s Paintbrush: The Patterns and Colors Around You. Her first question, “Have you ever noticed the patterns and colors on plants and animals?” serves as an introduction for her text. In subsequent pages she asks a related question and provides a concise answer. In Looking Closely Inside the Garden, Frank Serafini uses a series of close-up photographs of nature to help students imagine what they are seeing. His central question, What do you see? Is followed by two possibilities that peak curiosity. Why is your tongue so long? This interesting pairing of photography, art, and informational writing in both Serafini’s and Jenkins’ books provides a new approach that is highly motivating for students who consider themselves artists and appreciate an additional lens to add to their writing endeavors. Like scientists, students can pose questions and observe the world around them to notice something extraordinary. In one fifth grade classroom students were examining books by Sneed B. Collard III in preparation for an author visit. In thinking about the kind of structure Collard uses to deliver information, the students discovered that in many of Collard’s books there is an underlying question that leads to a general observation and focus. For example, in Leaving Home, Collard explores how the young of different animal species leave the parents. Sooner or later, we all leave home. And some of us swim. The book continues in this manner, and on each page there is a paragraph that gives an example of an animal that behaves in that manner accompanied by a detailed explanation. He uses this same structure in some of his other books such as Teeth, Wings, and Animals Asleep. The students also looked at books by other authors who use this type of structure including Melissa Stewart’s A Place for Birds, A Place for Butterflies, and A Place for Frogs and Dianna Hutts Aston’s A Seed Is Sleepy, An Egg Is Quiet, and A Butterfly Is Patient. The students decided that perhaps they could use these books as mentor texts and create a class book that uses the same structure. As Collard did in Leaving Home, they wanted to explore something that was common to all animals. The subject of food came up, and through discussion they agreed that their research would focus on what and how animals eat. First, they did a lot of reading in books and on the internet. Some had a particular animal in mind, while others were more open in their approach. The students discovered that some animals eat alone, while others eat in groups and that some animals swallow their food, while others chew. They discussed all of their findings in small groups as well as whole group, then each student decided on what page they would write for their class book, All Animals Eat, imitating the structure of Collard’s Leaving Home – a general statement with an example and a paragraph of explanation. One of the fifth grade Common Core State Standards for informational writing asks students to provide a general observation and focus for a topic, develop it with facts and ideas, and provide a conclusion (20). Without realizing it, this fifth grade class was working towards meeting that important standard. Sometimes an author chooses to organize an informational text in the many voices of an era – a particular time and place of importance or interest. Persona writing can establish an intimacy with the reader almost immediately. In Colonial Voices: Hear Them Speak, Kay Winters offers a collection of poems in the many voices of the Boston colonists that lived during the time of the American Revolution. She did not choose to represent famous people. Instead, her voices represent ordinary people and their various occupations written as first person accounts – the clockmaker, the tavern keeper, the milliner, etc. From her poems we get an inside view of both Loyalist and Patriot perspectives. Winters includes additional information about the various occupations as historical notes at the back of her book. She repeats this structure in other books such as Voices of Ancient Egypt and Voices from the Oregon Trail. Students may notice that often authors will repeat an organizational structure that works well for them. When a writer discovers the best organizational scaffold for a text, he will also know that he has found a way to keep his topic fresh and unique for his readers. Persona writing for informational texts can take many forms. Molly Bang writes in the voice of our sun in her book My Light, and G. Brian Karas writes in the voice of the ocean in Atlantic. Poets such as Douglas Florian and Joyce Sidman use this persona structure, too, to impart information in an interesting way. Students can find ways to use the scaffold in Turn of the Century: Eleven Centuries of Children and Change by Ellen Jackson. In this book Jackson writes in the persona of eleven children from centuries ranging from 1000 A.D. to 2000 A.D. She shows us a day in the life of different children and couples this short narrative with some facts about life during that century. For example, we learn that Alice, a ten-year-old chamber maid living in the year 1400, was not able to read or write. In the list of facts about the year 1400, we learn that girls as well as boys were sent out to work at an early age. Persona writing can be used across the curriculum. Instead of writing the “traditional” president reports, students could imitate the organizational structure from Turn of the Century to write in the voice of the president they are researching. They might choose to write in the president’s voice as a child, a young adult, and as the nation’s president. The list of facts could represent key events that happened in the country or around the world during the time in which the president lived or lives. In science, students could become various plants or animals from the rainforest and describe their place in the ecosystem. The facts could include information about how serious the threat of extinction is for each plant or animal and detailed information about its actual size and location in the world. By studying mentor texts students can gain proficiency and acquire a multitude of organizational scaffolds to help them synthesize information from complex texts and make it their own. The scaffold is like the glue that holds everything together. Scaffolds enable students to think and write about information and use their writing processes and what they know about good writing to convey their ideas to a target audience. The Common Core State Standards brought attention to informational writing. The standards ask students to put forth the same energy and stylistic consideration for composing informational writing as they do for narrative writing. But as teachers, we can’t let standards be the focus of our writing instruction and practices. In his book In the Best Interest of Students, Kelly Gallagher reminds us that in this climate of standards- based instruction, it is important to keep best practice in the foreground of writing instruction. writing instruction around the new standards?” is the wrong question. Teaching students about organizational scaffolds can go a long way toward helping students deliver information to their readers in unique and powerful ways. This kind of teaching requires a shift in thinking away from using the five paragraph essay for every informational piece we write. Studying global structures will provide both choice and challenge, two ingredients for effective instruction and meaningful, lasting learning. When we create classroom environments that include high-quality mentor texts and allow students to participate in an inquiry approach, they can discover new ways to organize their writing across the content areas. they are today (Dorfman and Cappelli, 5). Aston, D. H. (2006). An egg is quiet. San Francisco, CA: Chronicle Books. ________________. (2014). A seed is sleepy. San Francisco, CA: Chronicle Books. Bang, M. (2004). My light. New York: Scholastic. Brown, L. (2006). How to be. New York: HarperCollins. Calkins, L., Ehrenworth, M., & Lehman, L. (2012). Pathways to the common core. Chall, M. W. (1992). Up north at the cabin. New York: William Morrow and Co., Inc.
Collard III, S. B. (2001). Wings. Watertown, MA: Charlesbridge. _______________. (2008). Teeth. Watertown, MA: Charlesbridge. writing through children’s literature, K-8. Portland, ME: Stenhouse. ELA classroom. Portland, ME: Stenhouse. changed a city forever. New York: Simon & Schuster. Jackson, E. (1998). Turn of the century: Eleven centuries of children and change. New York: Houghton Mifflin Harcourt Books for Young Readers. Karas, G. B. (2002). Atlantic. New York: Penguin Putnam Books for Young Readers. list poems, ed. Georgia Heard. New York: Roaring Book Press. of list poems, ed. Georgia Heard. New York: Roaring Book Press. National Governors Association Center for Best Practices (NGA Center) & Council of Chief State School Officers (CCSSO). (2010). Common core state standards for English language arts and literacy in history/social studies, science, and technical subjects. Washington, DC: NGA Center and CCSSO. libraries for children. New York: Houghton Mifflin Books for Children. Rylant, C. (1993) When I was young in the mountains. New York: Puffin Books. _____________. (2000). In november. New York: Harcourt, Inc.
Spinelli, E. (2004). I know it’s autumn. New York: Harper Collins. Stewart, M. (2009). A place for birds. Atlanta, GA: Peachtree. _____________. (2010). A place for frogs. Atlanta, GA: Peachtree. _____________. (2011). A place for butterflies. Atlanta, GA: Peachtree. York: Simon & Schuster Books for Young Readers. Winters, K. (2003). Voices of ancient egypt. Washington, DC: National Geographic. __________. ( 2008). Colonial voices: Hear them speak. New York: Penguin. __________. (2014). Voices from the oregon trail. New York: Penguin. 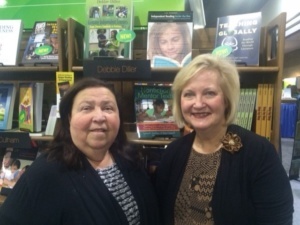 Rose Cappelli is an independent literacy consultant. She is active in the Keystone State Reading Association and her local reading council. Lynne R. Dorfman teaches graduate level courses at Arcadia University and works as an independent literacy consultant. She is active in her Alpha Delta Kappa chapter. Both authors also work with the Pennsylvania Writing and Literature Project at West Chester University and are frequent presenters at conferences and workshops nationwide on literacy related topics. They are the authors of Mentor Texts: Teaching Writing Through Children’s Literature K-6, Nonfiction Mentor Texts: Teaching Informational Writing Through Children’s Literature K-8, Poetry Mentor Texts: Making Reading and Writing Connections K-8, and a video, Writing with Mentors, all published by Stenhouse Publishers. ← Gravity and Renee: Ideas to Get Better Student Talk!